The first prompt of the year was posted over at Jingle Belles and I'm so happy to be playing along with them. I missed quite a few of their challenges towards the end of 2013 and I don't want that to happen again this year! 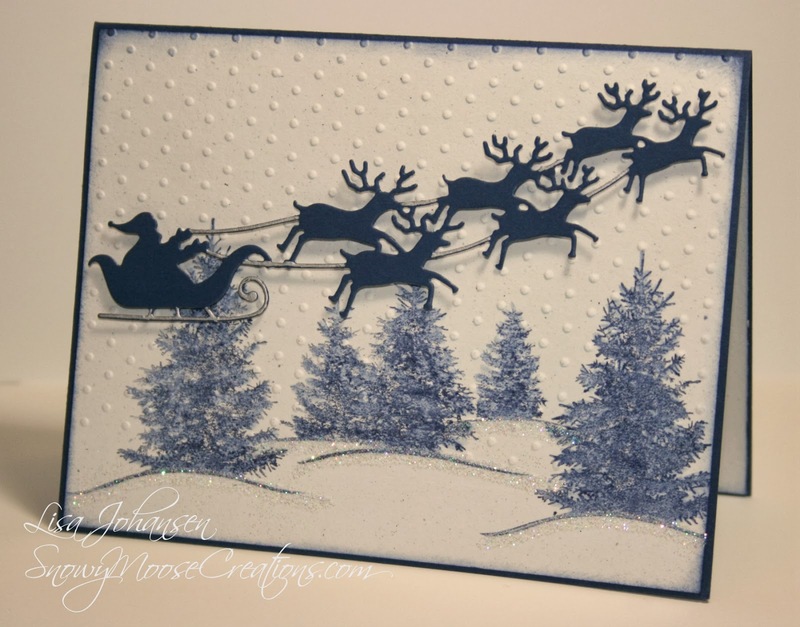 Stef and Lauren want us to mix old and new on our projects so on mine the new item is the Santa sleigh and reindeer die, and the old is the SU set I used called Scenic Season. I just love this set, its one of my all time favorites. I cant remember where I first saw this die but I knew that I had to have it and that I could use it with this set. 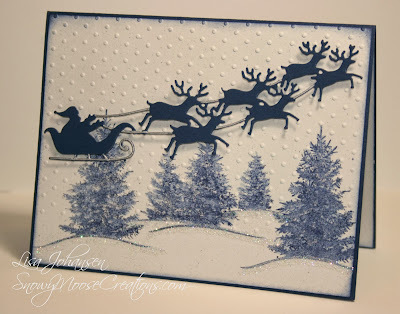 I added just a touch of shimmer by using SU's Silver Dazzle pen on the sleigh and also on the guides between the reindeer. As I usually do when stamping these trees I embossed the paper with the CB Swiss Dots embossing folder to get the look of falling snow. I chose to use Night of Navy as my ink because here in Alaska we have short winter days and our spruce trees tend to take on a blue cast in the waning daylight, especially when surrounded by a blanket of snow. Its even more pronounced on nights when the sky is crystal clear, stars are shining, its below zero out and the moonlight is reflecting off the snow. It casts an amazing color across the landscape that seems metallic in some ways and is just breathtaking. Sometimes on nights like that I just sit outside and enjoy the absolute stillness and beauty that surrounds me. Oh I've missed your beautiful cards and your delightful descriptions of snowy Alaska! This is just gorgeous. Hoping to be playing along too this year more than last. I missed a lot in the summer. Wowza ... this is absolutely stunning in blue ... your landscape looks magical ... so very glad you joined us as we celebrate the old & the new at Jingle Belles. Oh my, my...this is so incredibly breathtaking! I love everything about it. I feel as though I could walk right into that snowy scene. Well done! Gorgeous card! I love the die, but what I'm really struck by is how dimensional your trees look! I love the shimmer on the card and your description of your Alaskan scenery almost makes me want to brave the cold and visit! Your description has me enthralled. I'd love to see those trees with their blue cast. Wonderfully done! Going to the deer for 'Tis The Season!